The first exhibition of the 2nd round tour is SWITZERLAND, the heart of Europe! The Nomadic “decob” is eco-friendly bags that have been made by various artists from around the world. The exhibit has traveled to Toronto, Tokyo, Osaka, Hong Kong, Shanghai and New York. The Nomadic “decob”in La Chaux-de-Fonds will take place in La Chaux-de-Fonds, Switzerland which is known as world-famous wathch making city from September 3rd to October 2nd. During exhibitions, various workshops and events will be held at the venue with the help of local artists. A limited numbers of La Chaux-de-Fonds memorial eco bags are also sold. We are also running a logo design contest for our venue, La Chaux-de-Fonds and the winning design will be printed on a limited numbers of La Chaux-de-Fonds memorial eco bags as well as used on both online and printed promotional materials for the event. 1. The design must be new, unique, innovative and easily recognizable. 2. It must include the these letters decob in La Chaux-de-Fonds. 3. You can submit up to three artworks. -First Place: Name acknowledgement at the event’s website, flyer and other promotional materials. The design will possibly be used on various backgrounds (white, black, and even other colors), and will be used in different sizes (a relatively small one on the website and badges, but a noticeably bigger one on signage). We would love submissions which work well with various colors but also with only one color used (for black and white printed materials for example). Designs should initially be submitted as low resolution JPG or PDF files (height and width 400px maximum). The winning design must be provided either as a vector graphic in Illustrator(.ai file) or in EPS files. You will be asked to transfer your copyright in the design so it can be properly protected for the benefit of the conference and community. Your design also must not include any other copyrighted materials for which any license is required. Don’t include anything which might possibly cause offense. Deadline: Submit all entries by July 31, 2010. LIFE IN ART Vol.2 "ACE HOTEL in New York"
“Ace Hotel,” with each room of it exhibiting art pieces like a gallery, opened in Mid Town NY. Some of the Zank & Mars agency artists took a part in this project. At this hotel, you can spend a day surrounded by art, as if you are at a solo exhibition. You can enjoy high quality artworks that you could usually only see at art galleries. Enjoy food, drinks, or read a book... how you spend your day in the room is up to you. By letting art be a part of your life, you can see art from a different point of view, or you can feel the joy of being close to art. This hotel should not be ignored by true art-lovers. When I first stepped into the hotel while it was still under construction, the first thing I noticed was how creative people involved in this project were. The existence of this hotel itself is a piece of art that was completed by their teamwork. Because they know the joy of sharing art and they feel it from the bottom of their heart, this art piece was created. This place also symbolizes NY. Ace Hotel is highly recommended for people who want to feel NY first hand. Arisa Itami spreads love to the world through music and art. Arisa is a Japanese artist who is a Jazz singer, an actress, and a curator. She works mainly in Brooklyn NY. In 2008, she visited Africa to teach origami art to children in Nigeria. To make art a part of daily life and to change the world with art, she started “Zank and Mars organization.” She operates an art gallery called Ouchi Gallery in Brooklyn where modern art was born during the art revolution in 1970s. As an artist, she was a part of the mural painting team for the Atlanta Coca Cola museum in 2007. 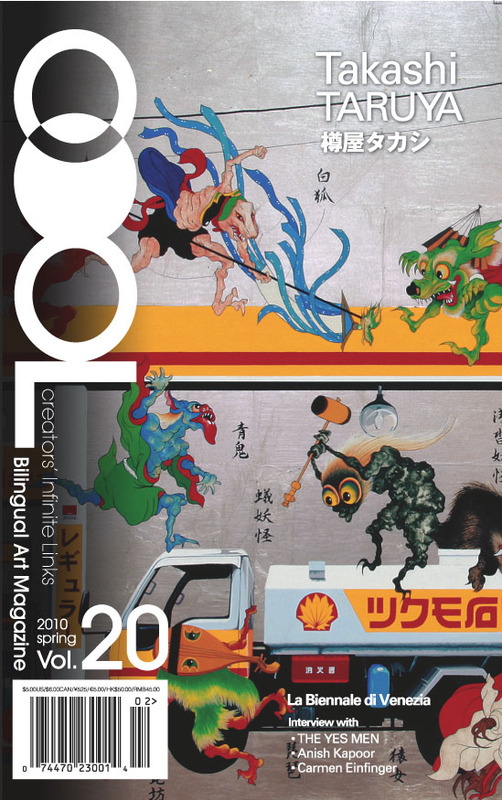 Arisa started a movement called “min-gei”, which is a fruition of her concept “LIFE IN ART.” The purpose of “min-gei” is to regenerate the Japanese folk art movement called "Mingei," which developed in the late 1920s, as a new style in the modern time. The theory of Mingei was to discover beauty in everyday objects created by nameless craftsmen and introduce it to the world. "min-gei" restores the movement in present time with a new theory: making art a part of our every day life. Arisa introduces “min(everyone’s)-gei(art)” so instead of seeing art as special and intangible thing, everyone would consider art as something familiar and intimate with our lives, just like our every day objects. The Color Of Love Org. Since it was established in 2009, The Color Of Love Org. has been dedicated to connecting artists with children and actively promoting artists world wide art scene. Why don't you work together and give the best we have to offer to our children? On April 23rd, Safe-T-Gallery will be opening its exhibition of paintings and hand-worked prints, by young Japanese artist, Fumiko Toda. Combining traditional themes of Japanese woodcuts with an exuberant 21st century sense of color and line, Fumiko Toda brings an original verve to her examinations of nature, how people view nature, and how urban life and more pastoral visions collide. “Recent Insects” focuses on a recurring theme in Fumiko Toda’s work. Brought up in rural Japan, she would often collect and take home the various insects found in the neighboring fields and ponds. The intricate beauty, not to mention the activity, of these creatures re-emerges in her colorful prints and paintings. Whether it is a single portrait of a rather fanciful beetle, or a somewhat supercharged landscape with various insects parading through in multiple dimensions, the images retain a marvelous sense of wonder and the promise to be found in the larger world. Fumiko Toda studied art in Japan where she graduated from the Kyoto University of Art and Design. Shortly thereafter she moved to New York and has continued her studies at the National Academy of Design, where she has won numerous awards and scholarships. A suite of her prints was recently featured in Moloko+ magazine. 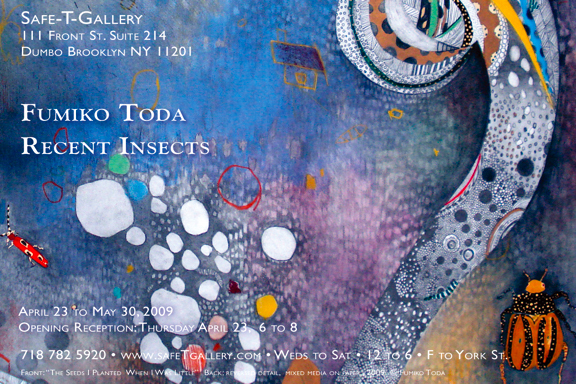 Fumiko Toda was seen in Safe-T-Gallery’s “Brooklyn au Naturel” show in the summer of 2008. “Recent Insects” will be her first one-person show in New York.